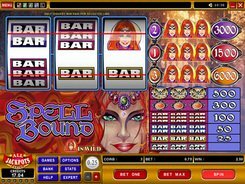 Spell Bound is a classic 3-reel 3-payline slot machine released by Microgaming and based on a sorcery theme. The symbols are traditional bars as well as a ring, an owl and a sorcerer. A coin size can be changed from $0.25 to $5. 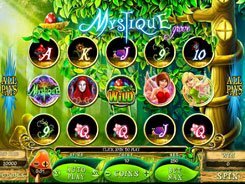 The slot accepts a single coin per line, thus the top bet reaches $15. 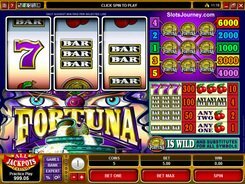 “Any Bar” combo is the cheapest one awarding 5 coins if any three bars fall on the payline. Matching three bars on the payline produces 25, 50 or 100 coins. Rings and owls are mid-paying icons, and the most lucrative symbol is the Sorcerer. 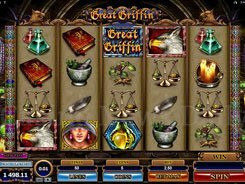 Three Sorcerers occurred on line 3 pay out the grand prize of 6000 coins. 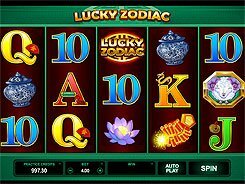 To maximize the award and win the cash equivalent of $30,000, you should play the highest coin denomination at the top bet. If three Sorcerers fall on line 1 or 2, you get up to $7500 and $15,000 respectively. 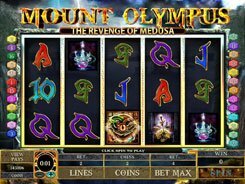 There are no scatters, bonus rounds and free spins in the slot, yet you can take advantage of a wild symbol represented by the Sorcerer. PLAY FOR REAL MONEY!